Homer Simpson has a love for cook-offs, so if he could, he would probably be at this weekend’s North Sacramento BBQ Rib Cook-Off on Saturday, June 12, from 3pm – 8pm at Renaissance Square Building. Photo a composite of images by thebittenword.com and Last Exit to Springfield. 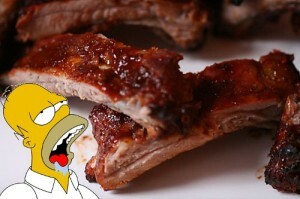 Visitors will be able to eat ribs and sides provided by vendors while watching the judgment of whose ribs are best. A beer garden will also be on site, along with live music performances by Dry Country Drinkers and Colonel Jimmy & The Blackfish. Tickets cost $8.00, which include a dinner plate of ribs and choice of two side dishes. Tickets available at Del Paso Antiques, the Del Paso Boulevard Partnership, and online at Brown Paper Tickets. This event is hosted by Massa Peal Catering and sponsored by Del Paso Boulevard Partnership. June 9, 2010 in Event, Fun.